Jell-O just released edible slime — but does it look like the real deal? For all the picky eaters who like to play with their food, this one's for you. We've all been told, "Don't play with your food!" But now, Jell-O is making it totally OK to mess around with dessert. With the holidays just around the corner, Jell-O has unleashed a new product that may be every youngster's dream (and every parent's nightmare): edible slime. 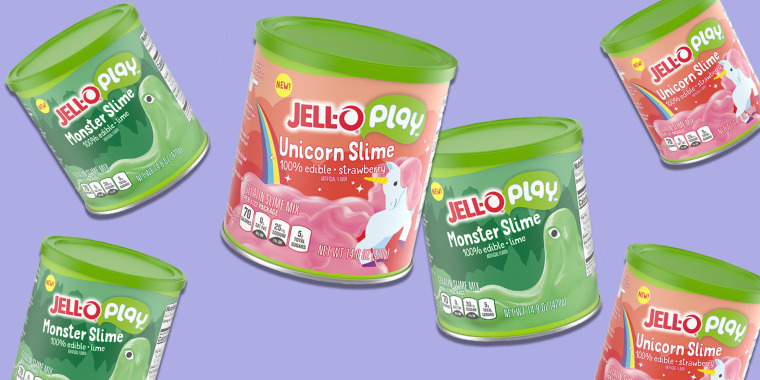 This summer, the brand first launched Jell-O Play, a line of "gelatin products" designed for parents and kids to have fun molding, shaping and eating their food. 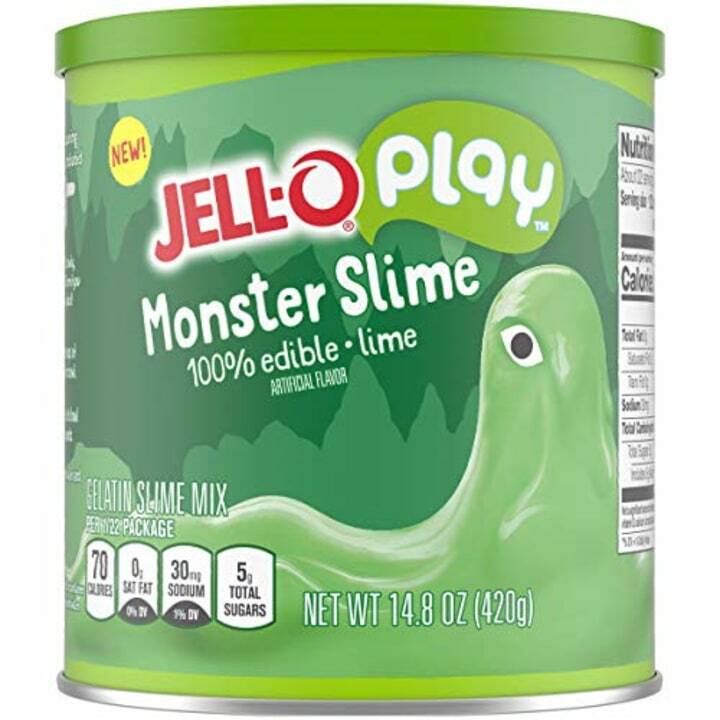 And on Thursday, Jell-O announced that its latest playful item — edible slime — is now available for pre-order on Amazon for $10 and will be ready ship out on Dec. 1. The product will come in two flavors: Monster (lime) and Unicorn (strawberry). Unlike traditional slime which is not edible (we repeat, not edible) and made of glue and Borax, the ingredients of Jell-O's slime include modified food starch, sugar, gelatin and less than two percent of adipic acid, disodium phosphate, sodium citrate, artificial flavor, fumaric acid and food coloring like red 40, yellow 5 and blue 1. In recent years, slime has become a major phenomenon, bolstered by viral how-to videos. The gooey matter even inspired tween entrepreneurs to launch their own slime businesses and has thousands of videos on YouTube and other social media sites. Jenna Bush Hager makes slime with YouTube stars Evan and Jillian! The slime obsession even inspired hilarious song parodies like "Slime after Slime." And it appears Jell-O was definitely paying attention to this wildly popular, yet incredibly gooey, fad. Of course, reactions to an edible slime product have been met with mixed reactions on Twitter. Several people wrote that playing with food, no matter how fun, is less than sanitary. Get germs into your food before you eat it! Others stressed how "gross" hands can be. Don't do this. Hands are gross especially if you've not washed them. Some just couldn't believe this wasn't created sooner. WHERE THE HECK WAS THIS WHEN I WAS A CHILD?! While other posted about how edible slime could've saved them many a Play-Doh incident. Where was this in 1986 when I was eating REGULAR Play-Doh? Many parents, however, just think it's a "bad idea." One tweeter brought up that the Jell-O could be confused with the non-edible version, which is definitely problematic. This is a terrible idea. Kids will think it's all edible. How long before the first kid eats borax slime? Borax, or sodium tetraborate, is one of the common ingredients in DIY slimes and is a natural mineral used for laundry and house cleaning. In March of last year, however, a mother said it actually caused second- and third-degree burns on her daughter's hands after she made slime with it repeatedly. On Amazon, despite Jell-O's new product being listed as a "best seller," there are already mixed reviews from people who tried the product for free. Several wrote that the consistency is harder than many other DIY slimes and felt more like clay. Many weren't thrilled with the taste, either. Most little kids, however, probably won't care how the slime tastes as long as they get the go-ahead from parents to dig in after playtime.